Fresh Productions Boxing, held today the official weigh-In for their card billed ‘Yo Voy A Mi’ which will take shape tomorrow Saturday, August 18 at the Tomás Donés Coliseum of Fajardo, Puerto Rico. 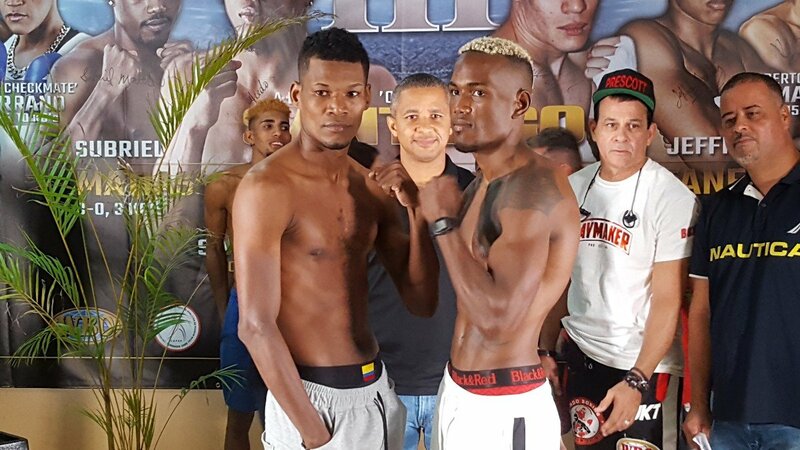 In the maximum weight of 123 pounds, Abimael ‘Manos de Piedra’ Ortiz (5-0-1, 3 KOs), and former Olympian Jantony Ortíz (8- 0, 4 KOs), from Humacao, did not have problems with the weight in their scheduled eight rounds fight. Abimael weighed 123 pounds and Jantony 122. For the vacant WBC FECARBOX Lightweight title , Dominican Alfredo ‘Ojo’ Santiago (9-0, 2 KOs) weighed 135 pounds and Argentinian Cristian Miño ( 19-1, 17 KOs) weighed 134.8 pounds, in a 10 round fight. Santiago, has notable victories over former Mexican Olympian Arturo Santos Reyes and world contender Jayson Velez, of Puerto Rico. Miño has wins over Argentine prospects Raul Ferreyra, Diego Marocchi and Gaston Rios, who were unbeaten at the time of the match. The freshly ranked # 20 by the WBC at Junior Welterweight division Subriel Matias (10-0, 10KOs), of Fajardo, weighed 137 pounds and Colombian Breidis Prescott (31-13, 22 KOs) weighed 141 pounds in a 10 round fight. In his last presentation, Matías defeated Mexican prospect Adrián ‘Diamante’ Estrella (28-1, 24 KOs) by 4th-round technical knockout. In addition, the boricua puncher has fast wins over Jeffrey Fontánez, former Venezuelan Olympian Patrick López, Brazilian puncher Joaquim Carneiro and world challenger Daulis Prescott, brother of Breidis. Breidis Prescott is known in the boxing world for his impressive first round knockout win over Amir Khan and his split decision victory over former WBA world champion Richar Abril of Cuba. In lost cause, Prescott has faced and reached the distance to boxers of the likes of Terence Crawford, Miguel Vázquez and Kevin Mitchell. In another competitive fight, Jovanie ‘El Lobito’ Santiago (10-0-1, 7 KOs), of Dorado and new member of Fresh Productions Boxing weighed 141 pounds and Colombian Andres Figueroa (9-2, 5 KOs) weighed 139 pounds in a duel scheduled for 8 rounds. Santiago, defeated former world champion DeMarcus Corley by unanimous decision in his last fight. Also in his resume he has a victory over Puerto Rican hot prospect Antonio ‘El Cacique’ Ortíz, who was unbeaten in six starts. In other matches, Angel ‘El Gallo’ Suárez (7-2, 3 KOs) of Guaynabo weighed 129 pounds and Francisco ‘Monkey’ Rodríguez (4-3-1) of Santa Isabel weighed 128 pounds in a 6 round fight. Patrick Cora weighed 153 pounds and Orlando Fernández weighed 149 pounds. Steven Ruidiaz weighed 135 pounds and Hector Gonzalez weighed 134 pounds. José Aguirre of Arecibo weighed 130 pounds and Michael Estrada of Fajardo weighed 129. Luis Torres weighed 121 pounds and Alexis Diaz weighed 119 pounds. Bryan Álvarez weighed 120 pounds and Emilio Rivera weighed 122 pounds.